The ViGuard cost-effective viewing system provides a powerful video management and security tool. ViGuard video software allows the user to follow simultaneously many events, manually or automatically driven, and to record and retrieve them for further analysis. ViGuard is ideal for stores, offices, banks, and correctional and other facilities. 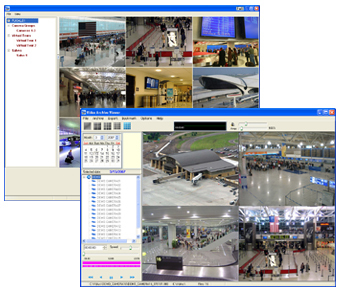 ViGuard allows the display of up to 64 cameras in multiplexed mode. The recording methods allow background recording continuously or per event. Each camera can be displayed and controlled separately. ViGuard can be defined as an event-driven system; automatic popup and recording is performed by external devices. Digital archiving and retrieving constitute an integral part of ViGuard; historical video reports are done using various parameters such as date-time ranges and cameras. Additional features allow copying selected frames into different media for further processing. Video-live can be captured and viewed by a PC, while indoor and outdoor VMD (Digital-Video Motion Detection) processes the video signals for alarms and the recording of events.